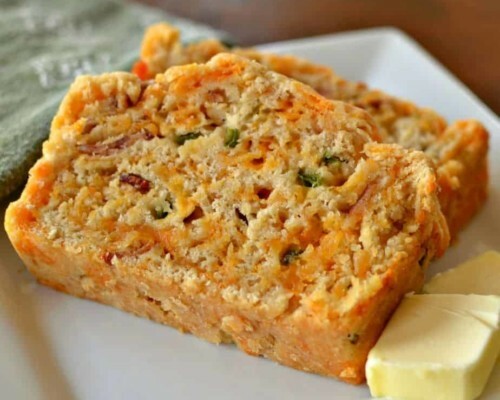 Bacon Jalapeno Cheddar Beer Bread has pieces of crispy smoked bacon, flavorful mildly spicy jalapenos and a generous portion of sharp cheddar. Preheat oven to 350 degrees. Lightly grease a 9 x 5 inch loaf pan. In large bowl mix flour, baking powder, salt, garlic powder, cumin, sugar, bacon, jalapeno pepper and cheddar cheese. Pour beer over mixture and mix just until combined. Do not over mix. Spoon into loaf pan. Pour melted butter over bread. Bake for 50-60 minutes or until set and lightly browned. Remove from the pan and allow to cool for at least 20 minutes before cutting into the loaf.